Since I started spinning, I've been looking at fiber in a whole new light. What used to be wool is now BFL, Merino, Shetland or Wensleydale. Once you start spinning and develop likes and dislikes, it's only natural to begin looking into the different fibers you've spun and others you might enjoy or stay away from. It has been a blast experimenting with the different fibers out there. It starts out quite broad. For example, I pretty much know I enjoy spinning most animal fiber. Silk? Not so much. I can see how that's going to be an acquired taste. I haven't bothered with cotton or linen yet. That just looks hard. And within all the different animal fibers, I've realized that I will pretty much like any wool but may never spin alpaca again. It was nice, soft, silky, and not difficult to spin but the hairs got everywhere and I can't say the final result was more interesting than any yarn I could buy. My first go was with some Bluefaced Leicester, aka "BFL". I was just starting out and after all the cursing and swearing was over, I enjoyed that wool quite a bit. Then, I moved onto Corriedale. I bought some from the Louet site and had read that it was "easy to spin". I enjoyed this too. Next was Shetland. Not my favorite. It's a bit rough and not the best thing for beginners. I'll have to revisit that one in the future. Just as my obsession with wool and sheep (do you know how many shearing videos are on youtube?!) was growing, uncontrollably, I walked into Knitty City last week and wouldn't you know it... two sheep farmers from Upstate New York were about to make a presentation about their flocks. I couldn't believe my luck. Cecilia Tkaczyk and Virginia Scholomiti, two neighboring farmers, were kind enough to share their experiences. Cecilia breeds Jacob sheep and Virginia breeds Wensleydale and Teeswater sheep. Two completely different types sheep. They brought a lot of their yarns, handspun and millspun for us to touch, feel and buy. But what caught my attention was the big pile of Jacob roving, light and airy. Since Jacob sheep are spotted, the roving is naturally multi-colored. 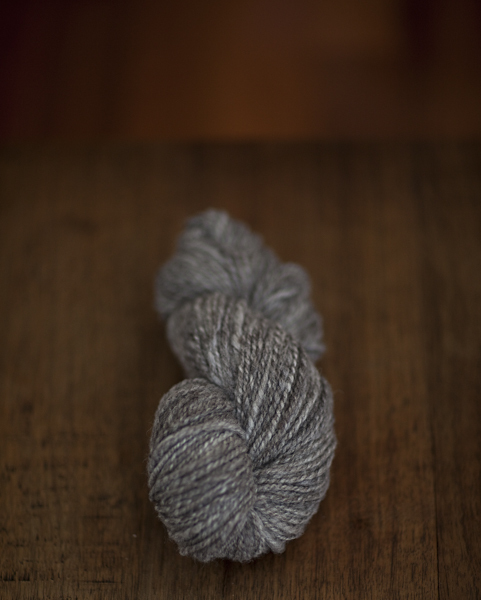 Between every task and with every spare moment, I sat down to spin up the Jacob wool. What a delight! I was able to try the long-draw drafting technique. After playing around with the alpaca, I was really thirsty for something not so dense, with a lot of air and fluff. I definitely got it with the Jacob. I can't wait to knit with it... perhaps a cowl? To help my obsession along, I also ran out (actually ran to my desk to get online) and bought "The Fleece & Fiber Sourcebook". That has been my bedside reading for the past few nights. Perfect for counting sheep.